All M4P songs come with DRM protection. If you want to enjoy M4P songs on all your owned music players, you need to remove DRM protection and convert M4P to M4A or MP3 first. 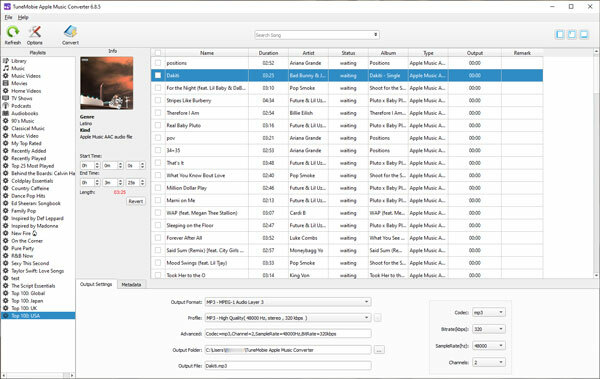 TuneMobie M4P to M4A Converter can easily convert DRM protected M4P songs to M4A without losing any quality, both M4P tracks purchased in iTunes Store before 2009 March or downloaded M4P songs from Apple Music subscription are supported. In this article, we will show you how to convert M4P to M4A. Before 2009 March, the songs purchased from iTunes Store are in DRM protected AAC audio files with M4P extension. Later, Apple stopped using DRM protection on songs and started to provide DRM-free AAC audio files which are in M4A format. When Apple Launched Apple Music streaming services in 2005, users found that Apple adopted M4P extension again for downloaded Apple Music tracks and DRM protection came again. To enjoy a song via iTunes Store, you can either purchase a DRM-free M4A song with one-time fee or subscribe Apple Music services to download the DRM protected M4P song. Both DRM protected M4P songs and DRM-free M4A songs are AAC audio. AAC means Advanced Audio Coding which is a proprietary audio coding standard for lossy digital audio compression. AAC audio could be in *.m4p, *.m4a and *.m4b extensions. Also, there is *.aac extension but a file with such an extension can’t be added to iTunes nor be recognized by all kinds of media players. M4P is now mainly used on downloaded Apple Music tracks and M4P is DRM protected, M4A is widely used any platforms and iTunes Store is selling DRM-free M4A songs, M4B is similar to M4A but with some extra features and mainly used as file extension for audiobooks, some websites provide free M4B audiobooks without DRM protection while iTunes Store is selling DRM protected M4B audiobooks. 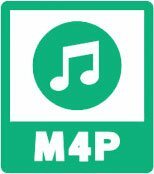 If you have iPod Nano, iPod Shuffle, Sony Walkman or MP3 player from iRiver, Sandisk or other manufactures, you will have to convert M4P to M4A or MP3 first in order to enjoy the M4P songs on them. TuneMobie Apple Music Converter is extremely easy-to-use and helps you convert M4P to M4A in 3 simple steps without any hassle. Launch TuneMobie Apple Music Converter and iTunes will be opened in the same time. Purchased M4P tracks and Apple Music M4P tracks will be listed as playlists in left panel. 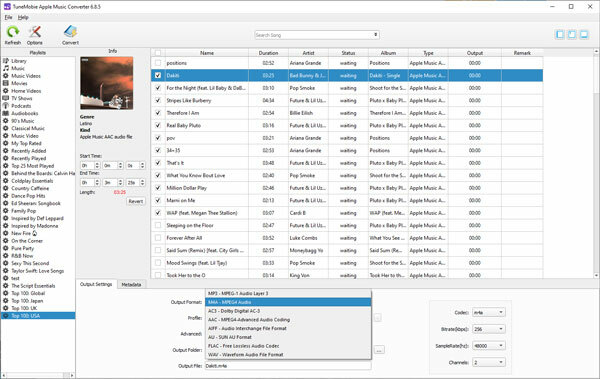 Tick the checkbox to choose the M4P tracks you want to convert. to locate your desired songs quickly. 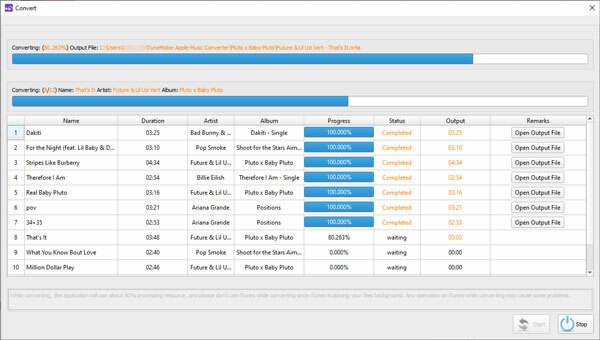 In the output format list, you can see MP3, M4A, WAV, FLAC, AC3 and some other audio formats. Here we choose M4A as output format. In the profile list, you can select audio quality. If you want to keep original M4P quality, choose 256kbps for M4A output format as the M4P songs provided by Apple are 256kbps. Now you can simply click Convert button to start M4P to M4A conversion, you also have a chance to change conversion speed and specify output file name by clicking Options and make necessary changes. When the conversion is done, you can simply click “Open Output File” to get output M4A songs. Now you can either sync converted M4P songs to iPod Nano or iPod Shuffle with iTunes, or simply copy to Android devices and MP3 players for free listening. TuneMobie Apple Music Converter not only works as M4P to M4A converter, but also works as M4B to M4A converter and AA/AAX to M4A converter to help you enjoy audiobooks on any devices freely. By converting M4P to M4A, you can also use your favorite M4P songs as Android ringtone or background music for video editing and DVD authoring software programs.